Cheesy potatoes with a ranch twist and topped with buffalo chicken, bacon, more cheese and plenty of buttery corn flakes. What's not to love? Are you looking for a stick to your ribs dinner that is full of flavor and easy to make? Then this is just the thing for you. It has all of that hearty, filling casserole goodness with a bit of buffalo chicken kick! And the cheesy ranch potatoes? They are a fabulous foundation to build the whole thing on! MiMi shared this recipe with me some time back. I was right in the middle of prepping for my brother's wedding, so I tucked it away waiting for the perfect time to make it. Despite being a million degrees out (or at least feeling dang close!) it seemed like I should go ahead and give it a go last month. 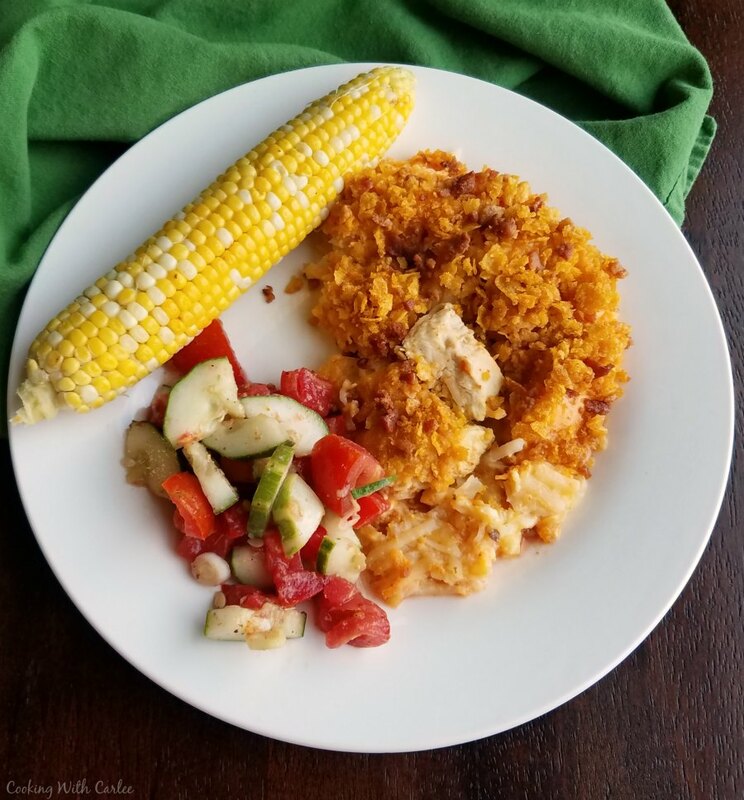 Sometimes it is hard to convince yourself to bake a casserole when it's so hot out, but sometimes you just need something simple to put together and filling. This wins on both accounts. Seeing the ingredient list I knew it was going to be a hit with my husband. Even Little Dude likes it if I make sure to get him a spot without too much buffalo sauce. That is easy to do, just don't drizzle the extras over a section so you have a mild part and a spicier part! My brothers are huge fans of this casserole too. Really, why not? 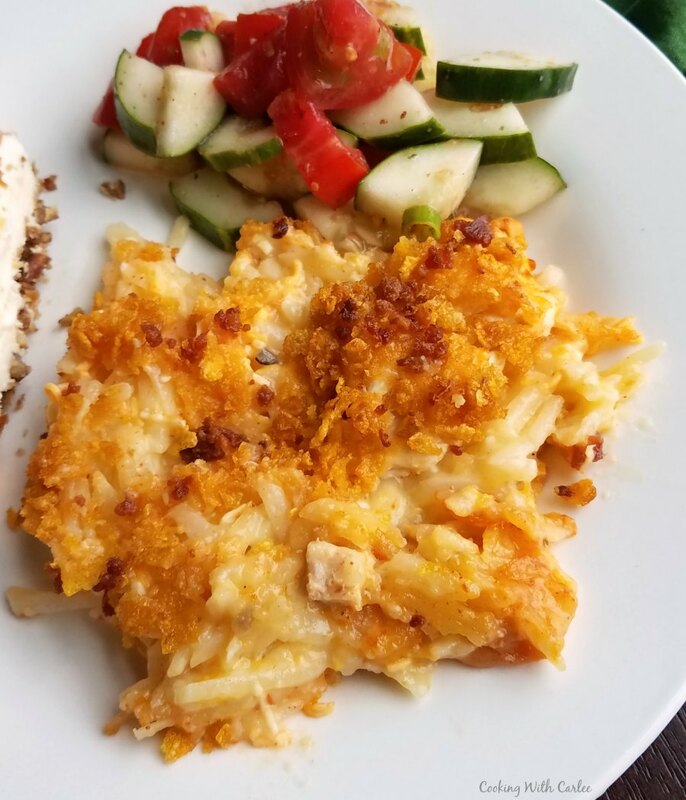 It's basically the classic cheesy potato casserole we all love, also known as funeral potatoes, with a ranch twist. Then load it up with buffalo chicken, more cheese, bacon and that buttery corn flake crust. Of course it's good! As you can see from the pictures, I have made this with both the frozen potato cubes and shredded hash browns. Both work wonderfully. Of course casseroles like this don't always look that exciting on the plate, and I normally have a couple of boys circling like hungry wolves when I am taking pictures. But trust your gut and your taste buds and know this tastes good even if it doesn't look amazing. If you like cheesy potatoes and buffalo chicken you just have to promise me this will be on your menu ASAP! Cut the chicken into chunks and marinate in the buffalo sauce for at least 15 minutes and up to 8 hours. Preheat oven to 350 F and spray a 9x13" pan. In a large bowl mix the potatoes, dressing, soup and 1 cup of shredded cheese. Spread potato mixture in the prepared pan. Top with marinated chicken. 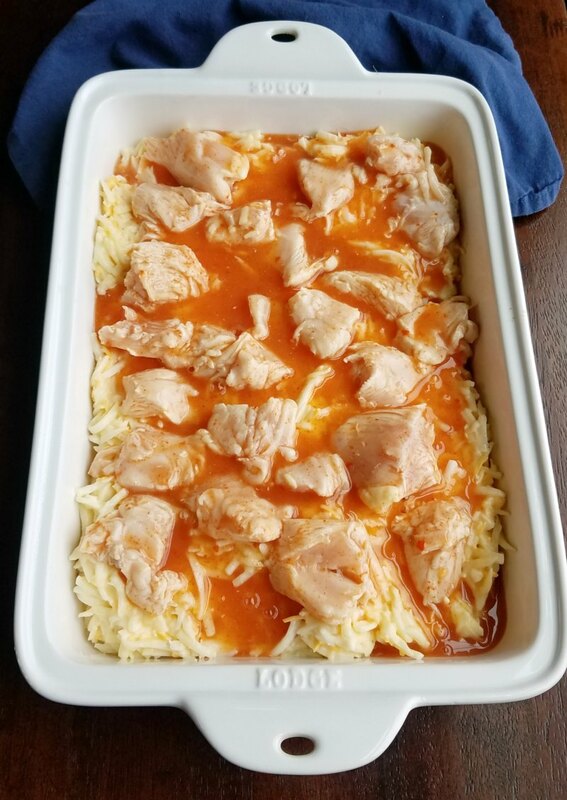 If desired, drizzle the buffalo sauce over the chicken and potatoes. Melt butter in a small bowl. Add the corn flake crumbs and toss to coat. 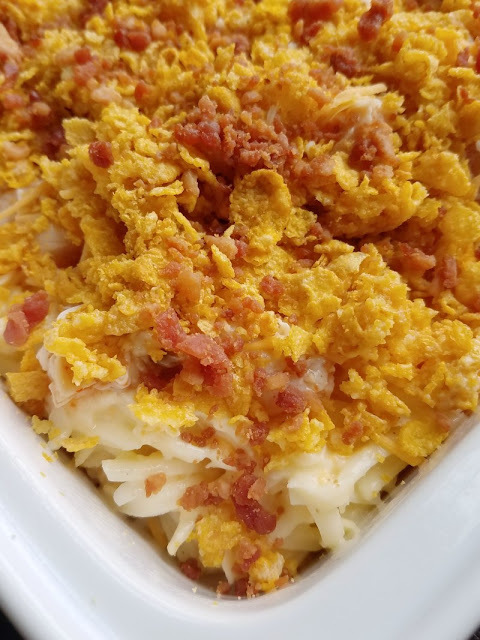 Sprinkle buttered corn flake crumbs, remaining cheese and crumbled bacon over casserole. Cover with foil and bake 35 minutes. Then remove foil and bake for 30-35 more minutes or until the casserole is bubbly and the chicken reaches 165 F.
You just HAVE to give this a go then. I can't wait to hear what you think. Oh my! Why can't we be neighbors??? 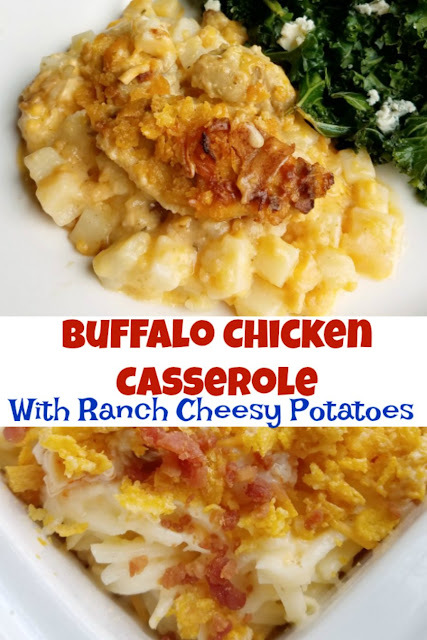 I would love this dish, husband however doesn't care for "buffalo". I'll have to tuck this recipe away for a work potluck! We should totally be neighbors!! Let's make it happen! Carlee, this looks truly SINful!! If you're accepting new neighbors, I'm in too! Thanks so much for sharing this at the Whimsical Wednesdays Link Party! Yes! You should totally move to the neighborhood! Genius! 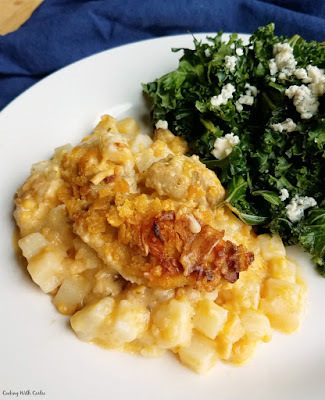 I cannot wait to try this- my husband is going to be so happy- he loves both wings and funeral potatoes! Then this is going to be perfect! I hope he loves it!